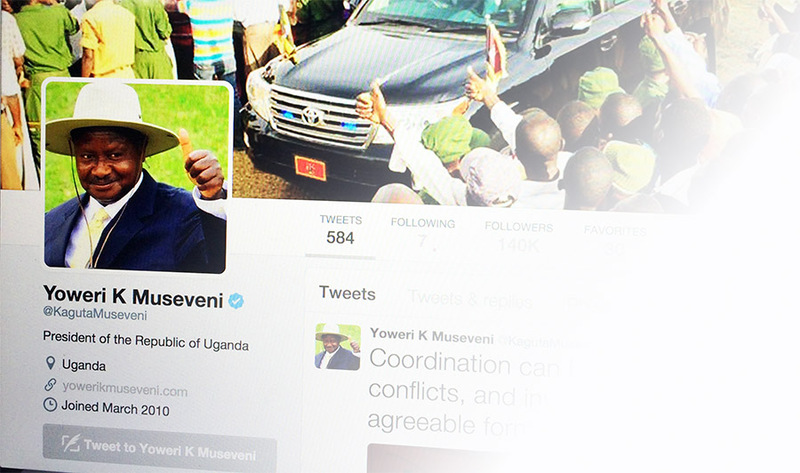 Home Columns Don't Blink Your Excellency… You Have A Tweet! A couple of months ago we saw headlines in Uganda that combined President Yoweri Museveni and WhatsApp. It appeared awkward at first and a few politicians quickly upgraded their mobile phones and downloaded WhatsApp on realising that perhaps Museveni could one day become a WhatsApp Admin with a Group like ‘Next Cabinet’. His attention had been brought (by the First Lady, no less!) to a WhatsApp message containing a recording of an exchange of insults between a Mukiga and a Muhima, and he thereafter warned all of us about using social media to promote sectarianism. A few weeks after that, however, that same WhatsApp message is said to have precipitated a political move of national significance. The theory goes that the day @AmamaMbabazi officially announced his presidential aspirations, he had been invited to State House for a meeting with the President about that ‘sectarian’ WhatsApp message. Being linked to a ‘sectarian’ message that pitted those two tribes against each other, then getting summoned by Citizen Number One made him believe he would be arrested that evening, so…cue declaration. Bunkum, of course, since nobody has been arrested at State House in the last thirty years and if anyone knows this it would be @AmamaMbabazi, but the main point is that WhatsApp was central in a national political story. Going well past that (forward, the pun would have it), last week we saw another President share headlines with a social media app, after CNN’s Global Executive Vice President and Managing Director Tony Maddox flew all the way from Atlanta, United States, to Nairobi, Kenya to deliver an apology over #HotbedOfTerror. See, while reporting on US President Barack Obama’s visit to Kenya, CNN News referred to our sibling neighbour as a “Hotbed of Terror”. Kenyans on Twitter (#KOT) immediately picked up the insult and launched a Twitter attack (via #SomeoneTellCNN) that railed mayhem onto CNN and foreign reporters the world over in general. The BBC and others reported widely on #SomeoneTellCNN and obviously relished doing so. A couple of weeks later, the Kenyan President was writing on his Facebook wall about the traditional media house (television) called CNN International having travelled physically by traditional means (aeroplane) to Kenya to deliver a traditional apology (verbal and written on paper) that resulted from a battle staged on Twitter. As I always say, there is no separating the social from the traditional when it comes to media reach or influence; but we’ve got to acknowledge both that social media is growing much faster, and that whereas traditional media is dwindling it is not going to disappear any time soon. And just like that, we have it on record that #KOT is a constituency recognised by their President and there will be no turning back from here. Meanwhile, the likes of #KOT are not going to relax any time soon, as they showed us again with #SomeoneTellKagame. #KOT immediately went, “NKT!”, loaded up their data bundles, and let loose on the strong man of Rwanda. This one didn’t elicit an apology from Kagame or trigger a battle between #RwOT and #KOT – in fact, @levikones even apologised to @PaulKagame for having annoyed the big man. But it has set a certain tone to Twitter because of #KOT and what they can achieve when anyone says anything negative about their country or compatriots – and we can build on that. We can spread that influence across the region and pull off an influential community like #EAoT that will defend the interests of the entire East African Community before the rest of the world. Or maybe even #AoT so the entire continent can make the world realise that Africa Is Not a Country and that we want to do more trade and take less aid, and so on and so forth. We can grow this Constituency into something bigger, more powerful and much more significant – since now the Presidents are paying it much more attention than before.